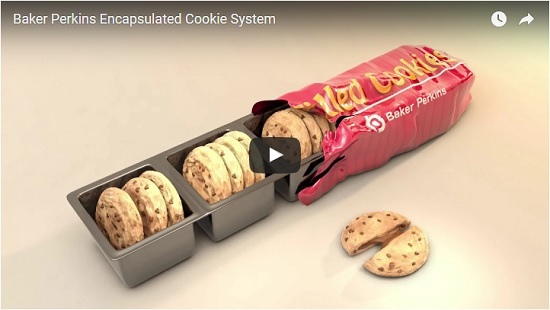 Baker Perkins has developed an innovative encapsulating system enabling high-value filled cookies to be made on any Baker Perkins wirecut machine. 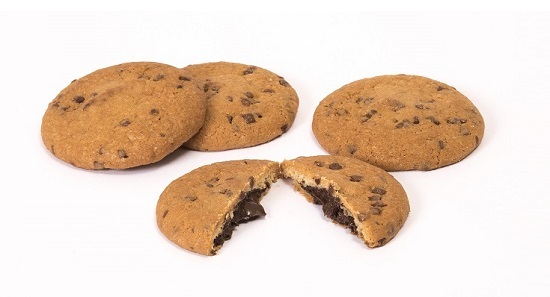 For the first time, cookies totally enclosed by dough can be produced on a module attached to a standard wirecut machine – previously a separate unit was necessary. The process involves pumping a continuous stream of filling into the centre of the dough cylinder formed at the wirecut die. A set of iris-die cutters crimp the dough and filling, forcing the dough to completely enclose the filling. Once the encapsulated cookies are on the conveyor band they pass under a tamping or gauging roll that flattens them slightly. This removes any machine marks caused by the iris die and ensures that the cookies are uniform thickness to help with packaging efficiency. The encapsulation module and iris cutter can be fitted to any new or installed Baker Perkins wirecut to convert the machine from a standard unit to one that can do both cookies and encapsulated cookies.